This product has been discontinued by manufacturer. You can read about the current Philips lineup here! I found Philips Sonicare HealthyWhite HX6733 when I was looking for a replacement for my rechargeable toothbrush for weeks. I was no longer satisfied with the one I was currently using back then, but I did not want to get just about any toothbrush. I asked my dentist if there is a particular brand of a rechargeable toothbrush that she can recommend to me and she told me about the Philips Sonicare Healthy White Premium 3 Mode power toothbrush. I have heard about the HealthyWhite toothbrush before, but I did not know much about its features. I asked my dentist to explain what its advantages are over other rechargeable toothbrushes and I also researched about it online. I was impressed with what I heard and read about it, so I decided to buy an electric toothbrush. It is a good thing that I did as it really is able to clean my teeth and gums thoroughly. My dentist also noticed how much my teeth color has improved since I started using it. To give you an idea of its cleaning performance, it is able to remove plaque better than other Sonicare toothbrush models including Essence and CleanCare toothbrushes. Because it is the premium edition, it also has more accessories than other Sonicare models. Here are some of the features that make the Sonicare Healthy White Premium 3 Mode power toothbrush a cut above the rest. 1 What is the difference between regular HealthyWhite and HealthyWhite Premium Edition toothbrush? 2.3 Philips Sonicare HX6733 vs HX6732 – which one should you chose? 2.4 Interested in a more advanced toothbrush? 3.2 HX6732 vs HX6711 – which one I would choose? 9 What is the best price for this product and where can you get it? What is the difference between regular HealthyWhite and HealthyWhite Premium Edition toothbrush? The difference between these 2 brush models is the package contents. The regular Healthy White (actually there are 2 products with this name) set includes the ProResults brushing head, travel charger with brush head storage, and the hygienic travel cap. The Premium Edition set offers twice as much. There are TWO Healthy White toothbrush handles and two ProResults brush heads, a HydroClean brush head UV Sanitizer with Integrated Charger included, PLUS a Travel charger and TWO Travel Cases. Sometimes it is quite hard to quickly understand the differences between similarly sounding Philips electric toothbrush names. Healthy White and Premium Edition of HealthyWhite is precisely this case. It took me some time to dig thru the specs of these products and find the differences. And here is what I have found out. Regular HealthyWhite and Premium Edition is basically the same product (the same toothbrush), but the Premium Edition includes several additional accessories and the most critical difference – Premium Edition includes 2 toothbrush handles. So you can see the main difference between these two products is that Premium kit is better suited for couples. It has two toothbrushes with two travel cases and UV sanitizer with built-in travel charger instead of the regular charger. There are also different brush heads included, but this is not a game changer as you will replace them in 3 months anyway. 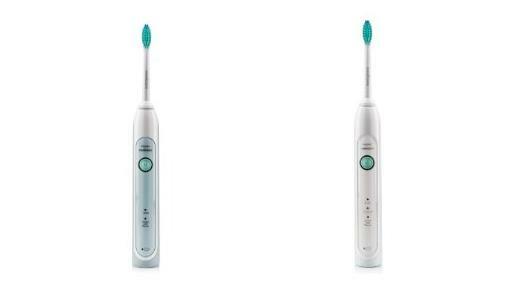 Philips Sonicare HX6733 vs HX6732 – which one should you chose? The answer is simple. Get the Premium Edition only if you need toothbrushes for two persons – either for you and your partner or for your kids (or rather teens because this toothbrush can be a bit too advanced for kids use). Interested in a more advanced toothbrush? Another alternative to this toothbrush is the DiamondClean brush, so I have also compared these brushes in the Sonicare DiamondClean review. There is also an older version of Healthy White toothbrush with a couple of differences. People are often asking lots of questions about Healthy White toothbrushes from Philips before they make their choice. The reason for this is that Philips has several Sonicare HealthyWhite models in the market and it is not always possible to quickly understand differences between them. I have already addressed differences of Sonicare HealthyWhite HX6732 vs Premium Edition HX6733 in one of my guides. In short, these products contain the same toothbrush handle bundled with different accessories. In addition to that HX6733 kit includes 2 toothbrushes, so it is best suited for couples (or 2 kids). But there is one more HealthyWhite brush – HealthyWhite HX6711. Is it different from HealthyWhite HX6732? Yes, the HX6711 is an entirely different model. It is an older model from Philips HealthyWhite toothbrush line. It is also known as Sonicare R710 (manufacturer’s code). Let’s compare these two power toothbrushes. So in other words, the older model HX6711 (R710) has 2 brushing modes (vs 3 modes in the new model) and one bundled brush head instead of two. The brushing mode that was added in the new R732 model is Sensitive mode. HX6732 vs HX6711 – which one I would choose? If I would be looking for a good power toothbrush and would not want to settle for entry-level Sonicare Essence toothbrush, the R710 is a perfect choice. If you have more money to spend and/or the Sensitive mode matters to you, then get the newer R732 model. While it is true that almost all electric toothbrushes promise users with a reliable cleaning performance, not all may be as effective as it promises to be. With the HealthyWhite, you can be sure of having much cleaner teeth and gums because of its Patented Sonic Technology. How does it work? Patented Sonic Technology from Philips uses a unique yet gentle cleaning action which allows it to effectively reach deep between the teeth and along the gum line too. Its Dynamic Cleaning Action ensures that your brush is able to provide broader contact with each tooth and allows it to remove everyday stains. That is why these toothbrushes have been clinically proven to whiten the teeth by at least two shades in as little as two weeks. This toothbrush also features a uniquely angled brush head so that the back of the teeth and other hard to reach areas can easily be accessed. This Sonicare brush offers three customized brushing modes – Clean, Clean and White and Sensitive. Clean mode is the standard 2-minute brushing for the overall cleaning of the mouth. What makes the Clean and White brushing mode different from the previous one is that it has an added 30 seconds of brushing which focuses on removing teeth stains such as tobacco, red wine, coffee, and tea. The Sensitive mode has been designed mainly for those with sensitive gums. It is able to clean the teeth and gum line gently yet effectively. The power toothbrush also comes with a Hydroclean brush head which helps to get further rid of plaque between the teeth and along the gum line. The Hydroclean brush head actually has the benefits of flossing as it directs fluid in between the teeth. 2 ProResults brush heads are also included to ensure that you get an all-around clean feel in your mouth. This toothbrush has a two-minute timer which ensures that you are able to brush your teeth for at least a couple of minutes – the amount of cleaning time dentists recommend. The toothbrush automatically switches off when you have completed the two-minute mark. Another great feature is the Quadpacer internal timer. It tracks your time so that you are able to brush each quadrant of your mouth for 30 seconds. When you have cleaned one quadrant for 30 seconds, the Quadpacer will give you a signal to move on to the next quadrant. The brush heads’ snap-on feature makes it is relatively easy to attach and remove it from your Philips HealthyWhite brush. When it comes to its battery, it lasts for 42 2-minute brushing which is about 3 weeks. You do not need to wait for the battery of your brush to be fully drained as there is a battery indicator which blinks when it is time for you to recharge it. The handle has also been designed to be slim and made of rubber for more comfortable handling while brushing. This power toothbrush is available in frost white and has a translucent white front panel. The HealthyWhite power brush has got very high star ratings from its users. Also, the majority of reviews are positive. Studies have proven that the best results are achieved using the new DiamondClean heads. They are a bit more expensive than ProResults heads but well worth the price. This toothbrush is often bought with products such as the 3-pack Philips Sonicare replacement brush heads. Many of the customers also get the Sonic Seal for FlexCare (pack of blue, frost and pink) which is a waterproof cover for your power toothbrush. People who get the HealthyWhite HX6733 also buy a Waterpik Ultra Water Flosser. It is a water jet has been clinically proven to be at least 93 percent more effective than regular flossing. What is the best price for this product and where can you get it? You can buy the power toothbrush from Amazon and other retail stores such as Wal-Mart and BestBuy. Many customers prefer to buy it from Amazon though as they can shop for many related items and also read reviews from other users.